After being fairly impressed with Astrophobos first self-released EP Arcane Secrets I let my colleague Andy form and voice an opinion of the band’s first, and for now only, full-length release Remnants of Forgotten Horrors. Seeing that our opinions about the style the band plays and music quality were very much in sync, I was fairly satisfied I didn’t mislead the readers recommending the Swedes for the fans of Swedish school melodic black metal. Well, this is just in. 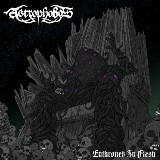 Astrophobos are back with another EP, but things have gotten significantly colder and nastier on Enthroned in Flesh. Further moving closer to Dissection guitar sound the title track greets the ear with an absolute buzzsaw. Perhaps unlike Dissection, Astrophobos is conscious about their bottom end, having it sound muscular and booming, very Marduk-like, the whole experience of Enthroned in Flesh coming off as drums and bass explosions crushing around grinding guitars. Tabula Rasa, racing further into “total oblivion”, reinforces the feeling that Astrophobos will no longer be mellow, and whatever melody one seeks is to be soaked from underneath the grime. Vocalist/bass player Mikael Broman’s voice also sounds more pissed, so his foul disposition matches the music. The B side maintains the edge, but in a slightly different way. Blood Libation, still showing no mercy, is a pagan celebration to start things off, in the tradition of old Necrophobic albums. Not entirely revolutionary music, but Enthroned in Flesh is where the band apparently wants to be these days, closing Blood Libation with a pure triumphant demonic arpeggio. Apparently no Astrophobos release can be without an epic composition and The Cadaver Monarch is that song where things unfold slowly, double bass rolls and guitars build up reminding of Sons of Northern Darkness by Immortal or Quantos Passunt ad Satanitatem Trahunt by Gorgoroth. The same crackling voice, slower pace and towering melodic tremolos, The Cadaver Monarch keeps tearing and tearing at the flesh. Even the EP title more suitable to hellish themes than horror books/movies, Enthroned in Flesh brought Astrophobos closer to the mainstream of Swedish black metal scene. Whether that is a good thing, if you liked any of the band earlier stuff, this is no worse for sure. Just slightly different.